Paintball is an adrenaline-pumping, action-packed, and exciting game which involves shooting capsules of paint at the opposition. Paintball is a fun game to play with friends and as part of a team and utilises skill and tactics. Test your paintball knowledge by reading these top 10 facts about the game. Paintball guns were invented in the early 1970s by the Nelson Paint Company. They were originally called paintball markers and were used by foresters to mark trees and ranchers to mark cattle from a distance. Paintball was invented by Charles Gaines, Bob Gurnsey, and Hayes Noel. Along with 9 others, they played the first game of paintball on June 27, 1981, with Nel-spot 007 markers. Whilst most recreational games of paintball can last anything from around 15-20 minutes to 45-60 minutes, the longest single non-stop paintball game ever played lasted from November 5 2015 to November 6, 2015, in Canada. The standard paintball kit includes safety goggles, a mask, a snood, coveralls, and a protective vest. If this kit is worn and safety rules followed, statistics show that paintball is safer than golf, tennis and swimming. Paintballs don’t actually contain paint, but rather gelatin capsules made of non-toxic, water-soluble, biodegradable, eco-friendly materials. When paintballs are shot, the gelatin skin splits open, leaving a brightly-coloured mark on the tagged player. A paintball gun, or marker, can fire a paintball up to speeds of 300 feet per second, and can fire a paintball as far as 50 yards. The first automatic paintball gun was invented in 1989 by Tippmann. Most paintball games involve eliminating the opposing team by hitting them with paintballs, but there are many formats a game can take. Another popular game is capture the flag, which involves capturing the opposition’s flags whilst protecting your own. Most recreational teams consist of about 10-20 players, but the number of players on each team can vary depending on the size of the playing zone. The largest paintball games are those based around a scenario. These include the Skirmish Invasion of Normandy and Oklahoma D-Day, which attract up to 4,000 players every year. 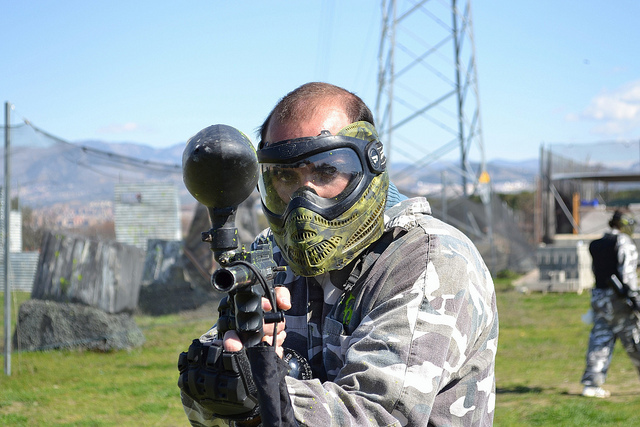 Paintball games are played in outdoor and indoor arenas. Themed game zones and scenarios are popular, and can take place in trenches, jungles, forests, battlefronts, and temple-themed arenas. The first professional paintball league was established in 1992. However, paintball is played worldwide in over 40 countries and enjoyed by those of all demographics, lifestyles, and abilities. This post was written by NPF who provide unforgettable paintball and outdoor activity experiences to all ages.